US$ 900 / person ? 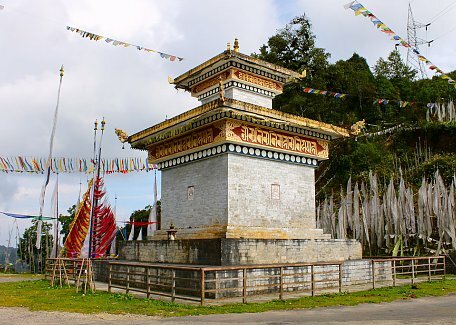 3 Trashigang – Mongar It's just 3½ hours drive to Mongar but it would be a pity not to make a 2 hours detour to Dramtse Gompa, which is one of the most important monasteries of eastern Bhutan. This is the place from where the famous Naga Chham (Drums of Dramtse), mask dance with drums originated. This dance is ubiquitous feature of many festivals and also it was included to the UNESCO list of of oral and intangible heritage. Monastery itself was founded in 16th century by descendants of the saint Pema Lingpa and it's name means "the peak where there is no enemy". There is number of interesting chapels with a lot of important statues of the saints and protector deities. If you're in mood for short hike, you can also pursue 1.5 hour scenic hike from Dramtse to Baging la via Shergang village (currently might not be possible due to road works). Alternative option would be easy half hour hike going downhill from Drametse to Baging village directly. After reaching Mongar, you will pay a visit to it's dzong (castle). Although built in 1930, the dzong maintains Bhutanese architectural traditions. 4 Mongar, excursion to Lhuentse Morning drive to Lhuntse which is one of the most rural and isolated districts in Bhutan. The landscape is spectacular with stark cliffs and gorges, beautiful conifer and pine forests and remote villages with rice, millet and corn fields. Kurtoe region of Lhuntse is the ancestral home of Bhutan's royal family. On the way, we will make a detour to Takey la, the place where the gigantic statue of Guru Rimpoche was recently built. Inside the statue, you find number of richly decorated chapels, which belongs to best in Bhutan. Further you will continue to Khoma village for most elaborate traditional cloths in Bhutan. Quality of weaving is so fine that even Royal Family places their order for clothes here. Village itself is interesting and beautiful so we will spend some extra time here having a lunch in local house and tasting local delicacies. Then we will continue to Lhuntse to see a dzong which belongs to one of the most spectacular monastery-castles in Bhutan, with total 7 chapels you can explore. Residing monks have welcoming reputation. Drive back to Mongar. 5 Mongar – Samdrup Jongkhar Today we will undertake full day drive back to Samdrup Jongkhar, reaching there in the late afternoon or evening. Not so much to see on the way, but definitely you would make a numerous stops for photographs. This will be your last day in Bhutan so celebrate the visit with your staff! 6 Back to Guwahati at noon After morning immigration formalities, you will tell good bye to your Bhutanese guide and driver and Indian counterpart will drive you to Guwahati, reaching there before noon to catch ongoing flight to your final destination. Merak-Sakteng (+2 to 4 days): Off beaten trail trek in eastern Bhutan is open just few years for tourist. You can experience life of Borkpas, distinctive nomadic tribe famous for their tailed berets and carmine red jackets. You can either just visit Merak village and get back to Trashigang next evening or you can make a hike to Sakteng and extend your stay in the country of yeti for a while. Hike is of easy to moderate difficulty and is accompanied with various cultural programs and interaction with the local people. See Best of Eastern Bhutan 8 days for details.